From the first half of 2015 Eric had been working on a new band. It has grown from his urge to really play “riff oriented groove music” to a full ensemble and play Electric Double Bass and Bass Guitar . In the beginning the band consisted of Aron Raams on guitar and Marc Schenk on drums. Starting as a heavy power trio they added tenor saxophonist Guido Nijs to the band quickly. Guido who had been Eric’s partner in E-Quad has been working with all pop stars in the Netherlands. His entry in the band accelerated the direction the band took. Heavy rock riffs mixed with soulful grooves and intricate soloing. Since Eric brought in the material based on his primal roots ( Blues & Bluesrock :Deep Purple, Led Zeppelin, Lynyrd Skynyrd, Cream, John Mayer; Jazz: Charles Mingus, John Coltrane, Miles Davis, Henry Threagill; Soul: Sly And The Family Stone, James Brown, Otis Reading; modern rock/hip hop Urban Dance Squad, Spearhead, Tricky etc.) he decided to call the band Private Time Machine (PTM). In 2016 the group started out as a quintet when Erwin Hoorweg was added on organ and Fender Rhodes but was replaced by Jeroen van Vliet. 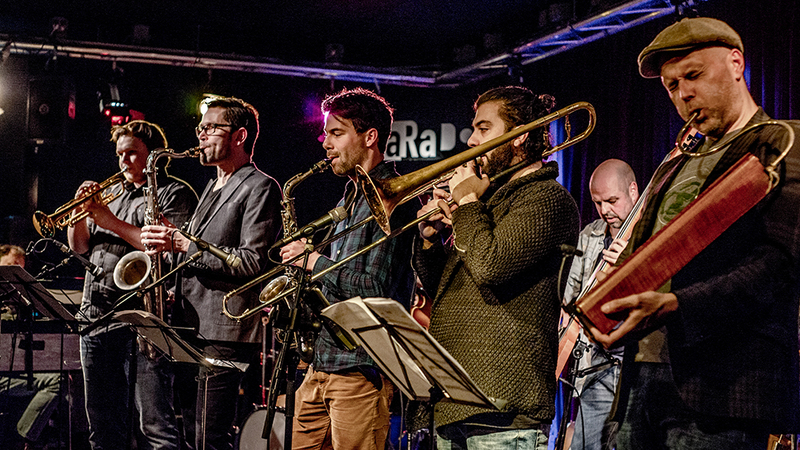 They started try out evenings in the club Paradox Tilburg Holland where they had the possibility to experiment with the material and add musicians to the group. It was Guido who turned Eric’s eyes to young and extremely gifted musicians like trombonist Efe Erdem, trumpeter Koen Smits and alto saxophonist Donald Simoen. Trumpeter Joël Botma whom Eric had encountered while working at MLB. Martin Fondse, the great composer and arranger is playing as the 2nd keyboard player using his Moog and Prophet synths to make his mark. Jimmy Rage is the voice of the band. His Spoken Words contributions which sit in between rap and poetry and give PTM a destinct own soundmark. Songs like “No Smoke On The Horizon”, “All In Vain” and “Colours Change In Time” have evolved into extended compositions with lots of room for solo’s and individual interpretation in contrast to the current trend of taking less and less time for individual creative experimentation. In the latter half of 2017 the band started playing “Playgrounds” clubnights with 2 hour plus set followed by a DJ battle dance event in Paradox Tilburg which let to full houses and a reach out to a new young audiences. The band recorded their first album in December 2017 in Studio Cell 4 Rossum The Netherlands. On June 6 2018 the final mix was done and on June 13 the mastering was done by Peter Brussee @ Q-Point in Hilversum.